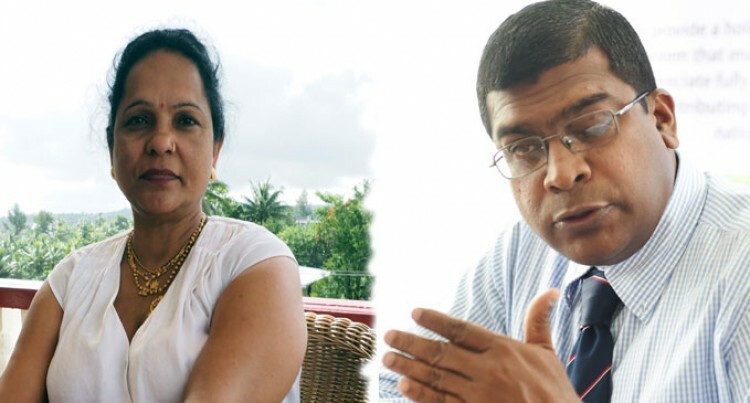 Minister for Education Mahendra Reddy and former acting permanent secretary Basundra Kumar last night traded accusations as an internal row broke out into the open. Mr Reddy said Mrs Kumar resigned because of an investigation against her being carried out by Public Service Commission. He said that it was in relation to a case at …….. College. “She was investigated by the ministry and then the preliminary report was sent to the Public Service Commission who then set up another committee to investigate her,” Dr Reddy said. “She was then presented with a report and a suspension letter outlining evidences against her on Monday afternoon. The suspension letter read that she was being indefinitely suspended without pay effective from yesterday. However, Mrs Kumar said the issue was dated back to October and questioned why she was not investigated then. She said this was a clear indication of personal vendetta against her. “The suspension is issued regarding a case at …….. College where the particular school principal was exercising lethargy and the Mathematics teacher did not know her work,” she said. “I could be sent on leave because I have some pending leave and I never took my leave. Dr Reddy said had Mrs Kumar been innocent then she would have attended the meeting and defended herself since the PSC provided her a chance to respond to the allegations against her. Mrs Kumar said she would write to the PSC and withdraw her resignation for a full and fair investigation to take place. She said if it was a fight of who was innocent and who was guilty, then she was ready to prove her innocence.